Hmm...that sounds intriguing, but I really don't want to become that spammy MLM lady. Also...I have barely any social media following, who would I sell to? I have my own business. Would this really be worth it? ...aaaand as you probably guessed, I decided to take the leap over 1 year ago when I partnered with Beautycounter, knowing that it WASN'T going to be the main focus of my business. I did, however, view it as yet another income stream that allowed me to make money from talking about something I genuinely loved, and being part of a mission I was passionate about. And since I know that there are a lot of Nutritionists, NTP’s and wellness bloggers who are considering taking the leap into becoming a Beautycounter consultant, I thought i'd rip the veil off what working with Beautycounter looks like in my business, and whether or not it might be right for YOUR business. I’ll also be answering the most frequently asked questions I get about becoming a Beautycounter consultant. Here's what “selling” Beautycounter looks like in my business. I don't post about Beautycounter on my personal Facebook page or text my old friends from high school, or DM people on Facebook/Instagram (<<< although these methods TOTALLY work for some people, just not my style). I don't stress about hitting monthly minimums. Honestly, I focus on my online courses and 1:1 business clients 95% of the time, and those things will always be the priority of my business. But, part of having a personal brand is sharing the things/products/makeup/food/books etc. that I truly LOVE with my audience, and for me, Beautycounter is one of those things. Plus...it's just a fun, feminine, girly outlet for me. Who doesn't like talking about makeup and skincare with their girlfriends? High-quality, non-toxic makeup that WORKS? Sign me up. Ahhh yes the most common question I get about Beautycounter to date. Is Beautycounter an MLM? The truth is…no. Beautycounter is not technically an MLM. It is considered “direct retail” because you don’t HAVE to buy the products through a consultant. In fact, we even have partnerships with retailers like Goop, J. Crew and Target that really set Beautycounter apart as a business and stand out from the MLM crowd. Beautycounter CAN, however, appear as an MLM because as a consultant, you do have the opportunity to build a team under you. Learn more about the ins and outs of everything direct retail and why Beautycounter is not an MLM by watching this video. Afraid your friends will judge you for starting a side hustle? Hmmm…I think this says more about their own career unhappiness than it does about you. I imagine if I were still stuck in a 9-5 job I hated and one of my old friends was traveling the world, spending more time with her kids, or working from home all thanks to sharing her favorite beauty products online, I might be a hater too. Do you have to hit a monthly minimums? No monthly minimums! You do have to hit $1200 in sales every 6 months however, to stay “active”. This sounds like a lot, but even if you only do 1 social every six months and that's it, this number is easy to hit. To learn more about which Beautycounter products are NOT vegan, click this link and they list them all out for you. How much does it cost to sign up to become a Beautycounter consultant? How much money can you make as a Beautycounter consultant? The answer to this question, as you may have guessed, is completely variable. There are some women that sign up just for their own discount, and make enough extra cash each month to fund their habit (yes, you make commission on your own purchases!). At the other end of the spectrum are people like Arsy from Rubies and Radishes who have put in the time and effort to not only products to sell to their own contacts, but also build a team, and she is making 6 figures a year. Talk about #Goals. What is the Beautycounter consultant discount? As a consultant you get a 25% off discount (including your own purchases!). What is Beautycounter's commission structure for consultants? As a consultant you start at 25% commission, but that percentage increases (up to 35%!) based on how much you sell each month. What is the difference between being a Beautycounter Band of Beauty member and a Consultant? The Beautycounter band of beauty rewards program is for people who love Beautycounter products but do not want to become a consultant. It is a 29$ yearly membership that gives you free shipping on orders over $100, 15% product credit on all purchases, and a free gift upon sign up. Learn more about the Beautycounter Band of Beauty program here. Can you be successful if you don’t have a social media following? YES! Actually, i'd say that if you have a lot of in person contacts (friends, family, colleagues) your chance of quickly growing you business and selling a hefty amount of product is much higher. There's nothing quite as powerful as talking about safer skincare, in person, with your friends and family members. Can you be successful without in-person contacts? That being said, I became a consultant right after I moved to Maui...meaning, I knew pretty much no one. All I had at the time was a few hundred Instagram followers and a supportive Mom. But I was still able to make it work and grow my client list without having to spam old FB friends. Want to talk 1:1 to see if Beautycounter would be a good fit for your business? Schedule a chat with me below! The products work. And as anyone who has ever struggled with hormonal acne knows, I was ready to do just about anything to clear up the painful, embarrassing cysts on my face, even if that meant chemical treatments (Yikes). I'm seriously lucky I never had to go that route though, thanks to these products. 2. Beautycounter is all about education first. 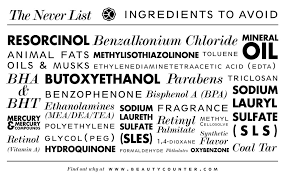 They are not out to scare you that your current skin cream is going to give you cancer, but they are very adamant about informing consumers about the lack of regulation in the beauty industry, and WHY safer skincare is important. 3. 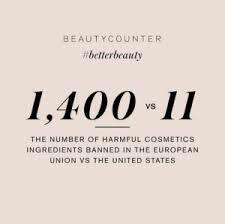 Beautycounter uses a rigorous screening process to make sure their products meet the highest standards for safer beauty, and they are transparent in all they do. They also use the highest quality sourcing as possible yet still insure their products are high preforming and department store quality. 4. They sell ocean-safe sunscreen that smells incredible. No brainer. Want to chat about what products are right for your skin type, or how you can incorporate Beautycounter into your business? Schedule a free session below! What questions do you still have about Beautycounter? Leave them below! Online Nutrition Business 101: How To Create A Website That Works For YOU! Want to create a profitable online course that brings in passive income for your nutrition/wellness biz? Here’s what you should know! Do you want to create YouTube videos for your Nutrition business, but you’re unsure of how to get started? This blogpost will give you an easy breakdown of how and what to film, PLUS how to get comfortable in front of the camera! How To Create Branded Instagram Story Highlights!